i've mentioned this a few times before, that behind every good man there is a woman. today, we celebrate the Solemnity of the Blessed Virgin Mary, the Mother of God! it is always good to honour Our Lady, especially today, a holy day of obligation. i love you, ..., now and forever"
as the beautiful Memorare prayer teaches us, no matter how many times i may have fallen, i sought your protection and intercession during my conversion - at this very time in 2002. what a journey you have helped me climb. help me always keep you close. if behind every good man there is a woman, then behind every good priest there is Mary, there is the Church. for showing me the meaning of success holiness"
the title The Mother of God has its focus on God in Our Lord Jesus Christ. 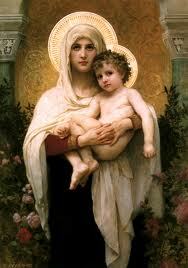 i am forever indebted to you, Mary for presenting me to your Son. it was in 2002/2003 that through you, at Notre Dame Cathedral Basilica, that i was introduced to God in Our Lord Jesus Christ, truly present in the Most Holy Eucharist - body, blood, soul and divinity - during adoration of the most blessed Sacrament. it is you who continues to be by my side helping me serve Him through His priesthood. today we also celebrate the World Day of Peace. both feasts point to the same reality: Jesus Christ. He is our peace, for all. thanks Mary for helping me know Your Son better, to love Him more. help me in 2012 to follow Him more closely, and to share the Good News with every one, to make Him known and loved by all. happy holy new year to you too Kayla! peace.